Who Makes Diameter Tape Measures? 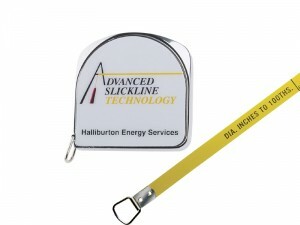 There are 4 main manufacturers of diameter tape measures. Lufkin® has a world-wide reputation for making high quality tape measures. They used to make them in the USA, but they have shifted the production facilities to Mexico. Some of the tapes are made out of a cast case, which is highly polished and chrome plated, like the w906pd. Others, like the w606pd have a stamped case, which is shiny and chrome plated. A third type of case is black plastic, like the asw616pd. However, the tape blade inside is the same in all 3 types of cases. It is capable of measuring diameters up to 23 inches. a cast case which is chrome plated. 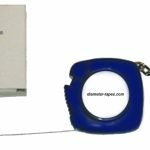 It can hold a longer tape blade, capable of measuring diameters up to 38 inches. The case is very durable. These are manufactured in China. Various other Chinese manufacturers make versatile OD tapes like the 416-04-024-P. 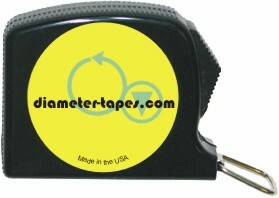 The back side of the tape measures diameter up to 24″ in 100ths of an inch or 610 mm. The case is plastic, and has a key ring attached to it. measuring pipes up to 45 inches in diameter. This is a belt tape, not a pocket tape. The calibrations are in tenths of an inch diameter.